Exercise and fun ---lawn aerating shoes, In addition to aerating your garden, it also cam be used a good workout for your calves & thighs after wearing them, you can also take it as a kind of fun stomping around the yard poking holes. 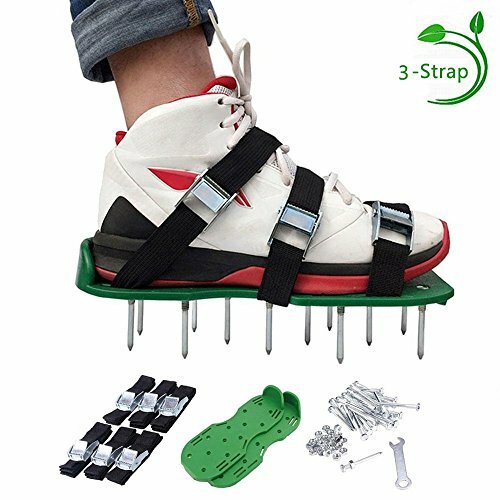 Easy to install ---lawn aeration spike shoes, 26 heavy duty spikes have been assembled by professionals during manufacture. Removing the unsafe risks of your own installation and ensuring that each nail will not lose. Saving your time and putting lawn aerator shoes into use quickly. Tested to prove that you can install six straps on a pair of lawn aerator spike shoes in a minute. It is the quickest and easiest way to aerate your garden!